Nestled amid the seaside charm of Monterey Bay, Portola Hotel & Spa offers a luxurious escape in Northern California. 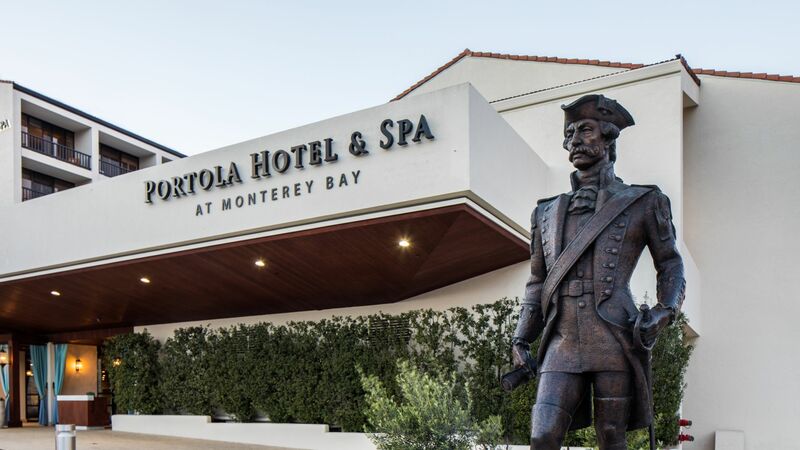 From our spectacular seaside accommodations to the largest day spa in Monterey County, it’s easy to say that Portola is a gem among Monterey Bay hotels. Outside of the property, you can discover a town teeming with activity, culture, and character, all dating back to the town’s humble beginnings. Discover the history of Monterey and Portola below. Monterey’s beginnings can be traced back thousands of years, with the Native Rumsien tribe attracted to the area’s abundance of fish, wildlife, natural resources, and mild weather. The Rumsien lived throughout the County, as evidenced by a number of sites found along the Monterey Peninsula, from Carmel to the present-day site of Fisherman’s Wharf. Spanish explorer Juan Rodriguez Cabrillo is recorded as the first person to see the Bay in November 17, 1542. Sixty years later, in December 1602, Sebastián Vizcaíno became the first European to set foot on the Bay, which he officially claimed as “Monte Ray Bay” after Spain’s Count of Monte Ray. As the Spanish presence in the region grew, many missions were built throughout the region, and Monterey eventually became the capital of both Alta (upper) and Baja (lower) California in 1776. 1822 brought Mexico’s independence from Spain and California’s allegiance shifting to the victor nation. The switching of hands saw the conversion of the region’s missions into ranchos. Mexico opened California to international trade and Monterey became a primary port of entry for the area, coinciding with a boom in demand for leather from the newly-established ranchos. The Mexican-American War led to the acquisition of present-day California, Utah, Nevada, Colorado, New Mexico, and Wyoming, as well as parts of Arizona. It is during the city’s time under Mexico when a number of “historic” firsts occurred, such as the establishment of California’s first theater, brick house, public library, and printing press, which produced California’s first newspaper, The Californian. US Navy Chaplain Walter Colton was appointed to serve as the city’s first American Alcade, serving duties of both Mayor and Judge. The area’s first public building, Colton Hall, was established in his honor, originally to serve as a town hall and school, though it would lead to much more. Colton Hall hosted California’s first constitutional convention in 1849, which brought about the documents necessary for statehood. On September 9, 1850, the U.S. Congress voted to admit California as the thirty-first state of the Union. From there, Monterey has become a gem in California, featuring a number of famous residents including John Steinbeck, Arthur Frank Matthews, and Robert Louis Stevenson. More recently, our city has been recognized as “The Language Capital of the World” due to its efforts in post-secondary language learning. The hotel’s name was selected because of its significance to the Monterey Peninsula. Before, being appointed Governor of Las Californias in 1768, Gaspar de Portola served as a soldier in the Spanish Army. Portola, who served as Governor for two years, was born in Catalonia and was of noble birth. Portola was an able organizer and a notable leader, and volunteered to lead an expedition up the California coast with stops in San Diego and Monterey. Portola eventually arrived in Monterey on May 24, 1770, the same year that European settlers began to colonize the area. Portola eventually went on to become Governor of Puebla, Mexico and ultimately returned to Spain in 1784. A statue depicting Portola can be found just outside the hotel.